Former United Nations Secretary-General Kofi Annan has died. The Ghanaian died at a hospital in Switzerland, Saturday morning after short illness, former Deputy Health Minister Dr Victor Bampoe confirmed it to Joy News. He was 80. Annan was born in Kumasi, Annan went on to study economics at Macalester College, international relations from the Graduate Institute Geneva and management at MIT. He joined the UN in 1962, working for the World Health Organization’s Geneva office. He then went on to work in several capacities at the UN Headquarters including serving as the Under-Secretary-General for peacekeeping between March 1992 and December 1996. 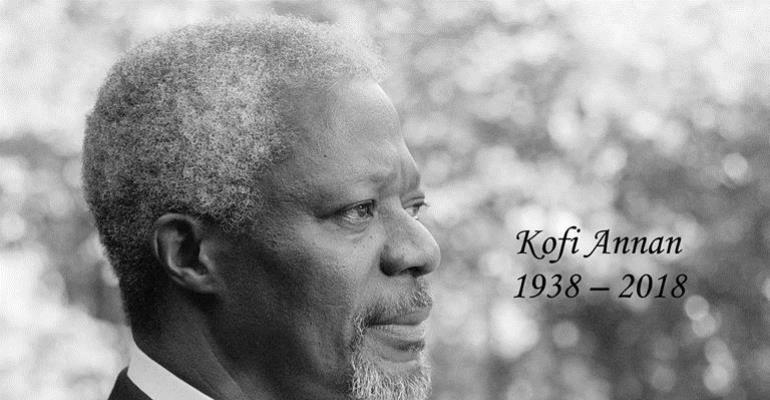 Annan was appointed as the Secretary-General on 13 December 1996 by the Security Council, and later confirmed by the General Assembly, making him the first officeholder to be elected from the UN staff itself. He was re-elected for a second term in 2001, and was succeeded as Secretary-General by Ban Ki-moon on 1 January 2007.